Harwich is a New England town on Cape Cod, in Barnstable County in the state of Massachusetts in the United States. At the 2010 census it had a population of 12,243. The town is a popular vacation spot, located near the Cape Cod National Seashore. Harwich's beaches are on the Nantucket Sound side of Cape Cod. Harwich has three active harbors. Saquatucket, Wychmere and Allen Harbors are all in Harwich Port. The town of Harwich includes the villages of Pleasant Lake, West Harwich, East Harwich, Harwich Port, Harwich Center, North Harwich and South Harwich. Harwich is also home to the exclusive Wequassett Resort and Golf Club. Barnstable County is a county located in the U.S. state of Massachusetts. As of the 2010 census, the population was 215,888. Its county seat is Barnstable. The county consists of Cape Cod and associated islands. 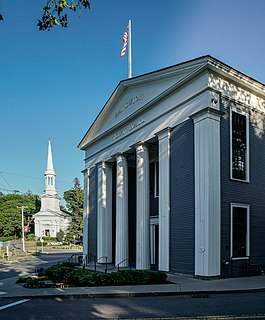 Yarmouth is a town in Barnstable County, Massachusetts, United States, Barnstable County being coextensive with Cape Cod. The population was 23,793 at the 2010 census. Tisbury is a town located on Martha's Vineyard in Dukes County, Massachusetts, United States. The population was 3,949 at the 2010 census. Bourne is a town in Barnstable County, Massachusetts, United States. The population was 19,754 at the 2010 census. Brewster is a town in Barnstable County, Massachusetts, United States, Barnstable County being coextensive with Cape Cod. The population of Brewster was 9,820 at the 2010 census. Falmouth is a town in Barnstable County, Massachusetts, United States; Barnstable County is coextensive with Cape Cod. The population was 31,532 at the 2010 census, making Falmouth the second-largest municipality on Cape Cod after Barnstable. The terminal for the Steamship Authority ferries to Martha's Vineyard is located in the village of Woods Hole in Falmouth. Woods Hole also contains several scientific organizations such as the Woods Hole Oceanographic Institution (WHOI), the Marine Biological Laboratory (MBL), the Woods Hole Research Center, NOAA's Woods Hole Science Aquarium, and the scientific institutions' various museums. Dennis is a town in Barnstable County, Massachusetts, United States, located near the center of Cape Cod. The population was 14,207 at the 2010 census. Hyannis is the largest of the seven villages in the town of Barnstable, Massachusetts, in the United States. It is the commercial and transportation hub of Cape Cod and was designated an urban area as of the 1990 census. Because of this, many refer to Hyannis as the "Capital of the Cape". It contains a majority of the Barnstable Town offices and two important shopping districts: the historic downtown Main Street and the Route 132 Commercial District, including Cape Cod Mall and Independence Park, headquarters of Cape Cod Potato Chips. Cape Cod Hospital in Hyannis is the largest on Cape Cod. The Cape Cod Baseball League (CCBL) is a collegiate summer baseball league located on Cape Cod in the U.S. state of Massachusetts. Many future Major League Baseball players have started there during their college years; MLB has provided financial support to the Cape League for over 40 years. During the 2014 MLB season, 265 CCBL alumni played in the majors; additionally over 1,000 CCBL alumni were playing in professional baseball in 2006. The Cape Cod Rail Trail (CCRT) is a 22-mile (35 km) paved rail trail located on Cape Cod in Massachusetts. The trail route passes through the towns of Dennis, Harwich, Brewster, Orleans, Eastham, and Wellfleet. It connects to the 6-plus mile (10 km) Old Colony Rail Trail leading to Chatham and 8 miles (13 km) of trails within Nickerson State Park. Short side trips on roads lead to national seashore beaches including Coast Guard Beach at the end of the Nauset Bike Trail in Cape Cod National Seashore. Barnstable is a city, referred to as the Town of Barnstable, in the U.S. state of Massachusetts and the county seat of Barnstable County. Barnstable is the largest community, both in land area and population, on Cape Cod. At the 2010 census it had a population of 45,193. The town contains several villages within its boundaries. Its largest village, Hyannis, is the central business district of the county and home to Barnstable Municipal Airport, the airline hub of Cape Cod and the islands of Martha's Vineyard and Nantucket. Additionally, Barnstable is a 2007 winner of the All-America City Award.